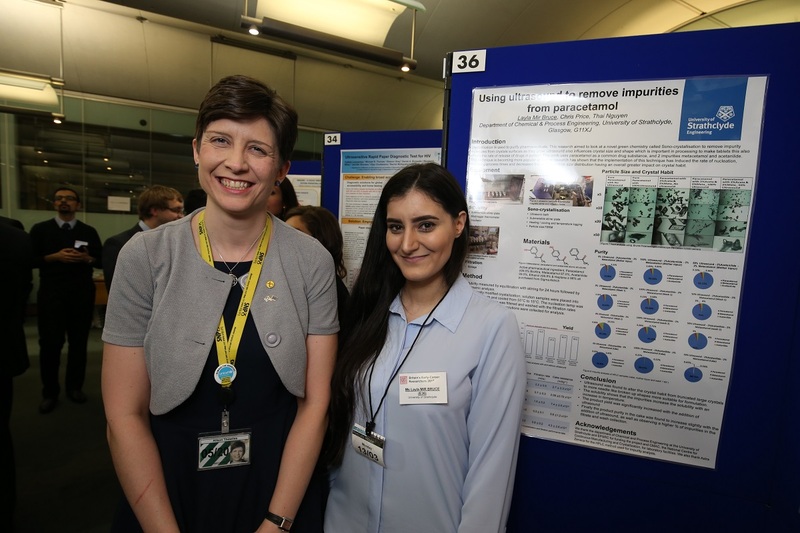 Alison Thewliss, MP for Glasgow Central, met local engineer Layla Mir Bruce at STEM for BRITAIN, a poster competition in the House of Commons involving over 200 early stage or early career researchers, organised by the Parliamentary & Scientific Committee. Layla Mir Bruce from the University of Strathclyde was shortlisted from hundreds of applicants to appear in Parliament and her poster about using ultrasound to remove impurities from paracetamol was judged by professional and academic experts against dozens of other scientists’ research, in the only national competition of its kind. “These early career engineers, mathematicians and scientists are the architects of our future and STEM for BRITAIN is a great opportunity to meet them and learn about their work. My constituency is home to 3 universities, all producing world-class scientific, technological, mathematical and engineering research, and their work is vitally important for building the industries that will sustain our economy for many years to come. “Today’s event is a two-way process designed to strengthen the dialogue between Parliament and the science and engineering community. Many colleagues in the House of Commons will meet researchers who live and work in their constituencies and will forge links and cultivate their contact in the future.